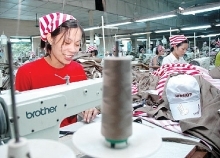 Foreign direct investment (FDI) in Vietnam surged in the first two months of the year as multinational companies have lined up to take advantage of the nation’s favourable tax and trade conditions. Vietnam’s Ministry of Planning and Investment (MPI) recently revealed that its preliminary tally of newly registered and supplementary investment for existing projects for the first two months of the calendar year was just shy of US$1.192 billion, up sharply from a year earlier. Meanwhile disbursements of FDI also jumped on-year to roughly US$1.2 billion, a good omen for the New Year. The top three investors for the two month period were the British Virgin Islands with investment of US$351.39 million, followed by the Republic of Korea at US$222.11 million and Japan at US$169.83 million. HCM City topped the list of 23 cities and provinces attracting the most investment while the northern port city of Hai Phong and Binh Duong province ranked second and third respectively. Exports from foreign investment including crude oil reached US$15.888 billion, representing an increase of 12.4% compared to the same period last year, contributing US$2.03 to the nation’s trade surplus.